Welcome to the El Dorado Trails - Segment 1 and 2 Project Page! Construction of the project was completed March 2015. The City is proud to announce that the El Dorado Trails Project - Segments 1 and 2 won APWA Sacramento Chapter Project of the Year in the Parks and Trails Category! Thank you to the support of the community through planning, environmental documentation, design, and construction for delivery of this wonderful community friendly project! 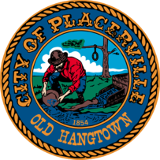 A special thank you to the El Dorado County Transportation Commission for securing funding for construction of the project.